Can you believe it’s almost 2014? Where did time fly?! I haven’t posted a recipe here in over 5 months! But I’m back just in time for the biggest holiday of the year. It’s that time of year again when people start shopping, wrapping presents, decorating their homes, cooking, and of course baking Christmas cakes! I’ve been wanting to share this recipe at the beginning of the month; I finally got my act together and prepared all the ingredients ahead of time. This cake, paired with coffee, is my weak point. It has a perfectly balanced taste of sweet dried fruits, dark brown sugar, and brandy. 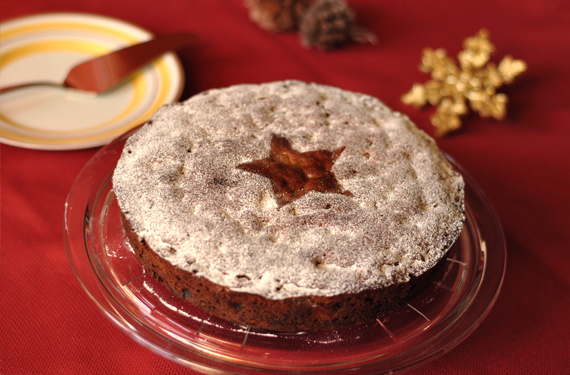 The secret to a richly moist cake is the amount of brandy you add to it: my mom bakes it a week before Christmas Day to mature it, and brushes the top of the cake with brandy at regular intervals. Woah! That’s an insane amount of liqueur. I prefer sticking to this recipe which is equally tender. Dried fruits are soaked in honey, brandy, and spices overnight to create juicy bursts of fruits. Baking pan is lined with two thicknesses of baking paper and batter is leveled with metal spatula. 1. Chop dried raisins, dates, and apricots to the size of the currents. Toss with brandy, honey, and spices in a small bowl. 2. Cover with plastic wrap and let sit overnight or up to two days. 3. Preheat oven to 350 °F (180 °C). 4. Line base and sides of deep 19-cm (7.5 inches) square cake pan with two thicknesses of baking paper, bringing paper 5 cm –2 inches– above side of pan. (Can also be baked in a deep 22 cm – 9 inches– round cake pan). 5. Beat softened butter and dark brown sugar in a small bowl with electric mixer until just combined. 6. Beat in eggs, one at a time, until just combined between additions. 7. Transfer mixture into a large bowl, add dried fruits, and mix by hand or wooden spoon. 8. Sift flour over the mixture, add the orange zest, and mix well. 9. Scrape and spread mixture into the pan. 10. Drop cake from a height of ~ 15 cm/5 inches onto the kitchen counter or the floor to settle mixture into the pan and to get rid of air bubbles. 12. Bake cake in oven for 1 hour. Give the cake quarter turns during baking to avoid uneven browning. Note: Cover cake loosely with foil during baking if it starts to over-brown. 13. Remove from the oven, brush top with extra brandy, and cover pan tightly with foil; cool cake in pan. 14. Cake can be served the same day, or stored for several days to create an even more moist cake (read storage tips below). • Nuts can be added to the fruit mixture ~1 cup / 125 grams blanched whole almonds or walnuts chopped coarsely. • Dust cake with powdered sugar before serving. • For storage: Turn cake upside down onto wire rack and peel the paper away from the sides, leaving the base paper in place. Wrap cake in plastic wrap and then foil to keep airtight, and place in a sealed plastic bag in a cool dry place. Cake can be refrigerated for up to 2 months, or frozen for up to 8 months.